Supplier to the indoor foliage industry, located in Apopka, FL. Grower and shipper of wholesale foliage plants located in Apopka, Florida. People, Places, Weddings, and Things, have been our business for over 26 years. Apopka. Professional photography for weddings, events, portraits, childrens vintage photos and parties. Apopka. Provides potential buyers a complete online listing of nurseries, brokers, transportation and other allied services. Gallery of graphic design work and photography. Also includes a portfolio of professional work. Apopka, Florida. Program, registration, schedule, standings, maps, and links. Includes program information, camps, trips, photos, leadership contacts, and calendar. Includes leadership contacts, meeting time and location, announcements, event calendar, and links. Breeding Cocker Spaniels (and Pembroke Welsh Corgis) for show or as pets. Located in Apopka, Florida. Breeders of Icelandic horses with some for sale. Located in Apopka, Florida. Hunter/Jumper training by A show rider with 13 years experience. Training for green-broke horses to accomplished show horses and lessons for beginner to advanced riders offered. Rates and service descriptions. Located in Apopka, Florida. Offering web and graphics design and search engine submission. Located in Apopka in Florida, United States. 21 Apopka Calvary Nazarene Church Apopka, FL. Featuring the research interests of George Farnsworth Aubrey of Apopka, Florida, USA. SiteBook Apopka City Portrait of Apopka in Florida. 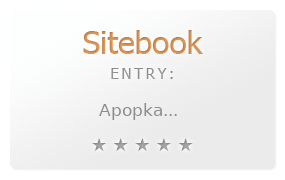 This Topic site Apopka got a rating of 4 SiteBook.org Points according to the views of this profile site.